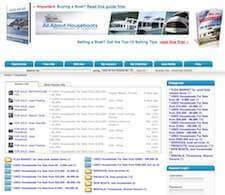 Houseboat Propellers - best props for house boats? 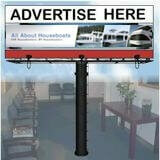 I have a 40' Crest pontoon houseboat with a single 90 h.p. outboard. When I reverse out of a slip, it takes a country mile to make any degree of a turn. When I move forward, the boat will turn on a dime. It was told to me that I replace my 3 bladed propeller, with a 4 bladed prop, I would solve the reversing problem. Will one more blade make that much of a difference on the prop? Well Tim, you have posted a great question that gets asked often amongst houseboaters everywhere, "what is the best propeller to put on a houseboat?" One of the best props for houseboats are the RHC Propellers since they provide better stopping, more reverse thrust, and improved handling. 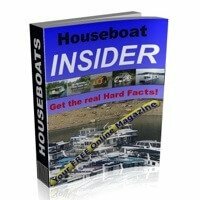 Before we get into ways of improving the reverse performance on your houseboat, we have to look at what makes for the "right prop" on any boat. We have to remember that we are talking about a heavy, slow moving, non-planing hull, that have will always have less performance in reversing out of a slip. Now will you see any real improvement in changing to a 4 blade propeller, personally I have never seen any real world performance difference when I have tested non-planing houseboats with a 4 blade model. Now your mileage may vary, but I think there is other things to look at first. see that it allows you to reach WOT? Now, if we start off by looking at the basics of what is involved in having the best prop on your boat, we have to understand what's really happening. The engine(s) has to be able to achieve the manufacturers recommended RPM (revolutions per minute) and WOT (wide open throttle) range. This is where you will gain the biggest performance, and handling improvements. Diameter = This is the overall exterior size from the tips of the blades. Pitch =The theoretical distance that the boat would advance in one revolution. Blades = Most of the popular propellers are available in 3, 4, 5 blade designs. Material = Aluminum, Stainless, Brass, and Composite materials are available. WOT = The "wide open throttle" rpm of the engine with average load and people. 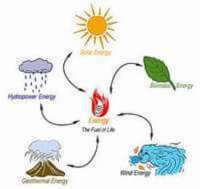 LH or RH = The most common is Right Hand rotation, but Left Hand is available. Thru Hub Exhaust = A popular feature with many engine and outboard engines. The most common problem that I have found in many houseboat propeller installations are that the prop is damaged, blades are dinged, or simply not the correctly sized propeller for the boat, load, and engine application. The correct propeller on a boat is vital and is the heart of the propulsion system. After many years of personally playing with different props and blades, the simplest solution for displacement barge style, full hulled house boats has always been to put the largest diameter propeller, with the correct pitch to allow the engine(s) to reach the recommended WOT. EX: 4400 - 4800 RPM. poor gas mileage, poor performance, and potentially damages the engine(s). I have seen many houseboats that have had serious engine damage, often causes by lugging an engine, with a prop with too much pitch. You probably have heard many folks say that they will just throw a bigger pitch prop, because they will never rev the engine above 2500 or 3000 rpm. They presume that they will get better gas mileage and better performance, however the damage is being done even if your running at 1000, 1500, 2000, 2500, or 3000 rpm. Personally, I would stay with your 3 blade prop, however I would do a little testing. You would first want to verify your engine manual, or read the specification sticker on the engine itself to see what the manufacturers recommended WOT range is. On inboard engines, it could be in the 4000 - 5000 RPM range, and on outboards, will often be in the 5000 - 6000 rpm. If you have access to a GPS, this is a great tool also to use while verifying the WOT as you can take note of the speed that you're achieving. You will be able to compare the speed now, with any changes you make to the prop. Now, take the houseboat out for a ride, with a friend if possible, and in a safe location, on a relatively smooth lake, open up the throttles, and read how high that the RPM's go. If you have access to a digital RPM meter, have your friend read the figures directly from the engine itself. If your houseboats WOT rpm is lower that the manufacturers recommended range, you will need to reduce the pitch of your propeller, @ 150-200 rpm per inch of pitch. So, to answer your question, should you spend your money on a 4 blade prop, not really, but do a little investigation into what you have now. I have also found that even though the propeller hub is stamped 16 x 11, and the propeller has previously been rebuilt, I would do a diameter and pitch comparison against a new 16 x 11 prop. I have seen prop shops that rebuild damaged props, and they come out looking good, but they don't match the original specs. If you damage a propeller, and decide to have it repaired / rebuilt, keep it onboard afterwards and use it as a spare, and only use it only till you buy a new replacement propeller. No disrespect to prop repair shops, it's is just that the good ones are getting harder to find. When you consider the cost of a new prop, compared to the cost of having one repaired, it just isn't worth the risk of engine or drive damage and repairs. 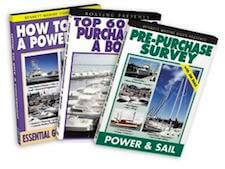 Do some testing, and do let us know what the figures are that you find out, and share them here with us, as I am sure there are many other houseboaters who are curious. Lastly, hopefully some of our readers will share and post comments about their houseboat propeller choices and experiences. Feel free to use the "Click here to post comments." link found near the bottom of this page. 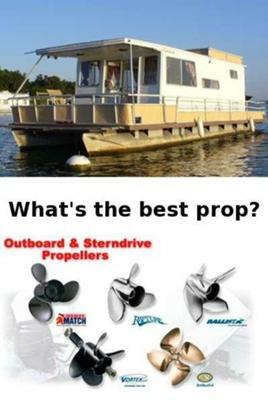 Comments for Houseboat Propellers - how many blades, material, for the best prop? Great information. What about counter rotating duo props? I know the inside prop is larger than the outside prop. How does this set up work with your general comments earlier? Does the pitch match on both? If I’m not obtaining MOT, which prop should I be adjusting? What would be a good gear ratio for a Bravo 2 that's pushing a 40ft houseboat weighing @ 15000 lbs...? I have a 40' Harbor Master houseboat. It had a Volvo Penta motor and outboard. 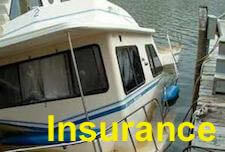 I bought it with a bad transom, and had it all replaced. The guy sold me a Bravo 2, but installed a Bravo 1, what do I do? What size prop will work for me, and should I go down the road and get a Bravo 2. It feels underpowered, and sounds like the motor is screaming. I have the same boat and I use the RHC Props and they provide the best control in turning and backing up I have ever used. Being a wooden boat builder and also owning and living on board my 47 foot house boat I am often asked why my houseboat is so maneuverable. Well it took a bit of time and patience, but this is how I achieved it. Firstly I have two Suzuki 30 HP outboards that came with standard propellors. They are great in forward, narda in reverse, so off they went and a set of high thrust props replaced them giving a much greater response. Although this improved the boats overall performance both forward and reverse, it was and still is sluggish in reverse. However I got sneaky when it came to maneuvering in and out of tight spots by fitting a 56lb electric trolling motor in between the pods, which was a third the price of a stern thruster and can be used indefinitely. A slow boat (houseboat) needs a big prop. A propeller doesn't reverse well. Because the blade is designed to rotate one way. Its like making an aeroplane fly backwards. The wings are designed to go forward not backwards. They would have very pour performance the other way. The best way is always reversible blades. But of course not on outboards. That would be my choice if money were no limit. Interesting light reading. This is a topic I'm very interested in because I need to replace the props on my 38' Holiday Mansion. I tried getting a quote from your RHC prop folks but after one email requesting additional information from me they've not gotten back to me. Any other suggestions would be great - but the Holiday Mansion has a planing hull (with twin Volvo 225D sterndrives).